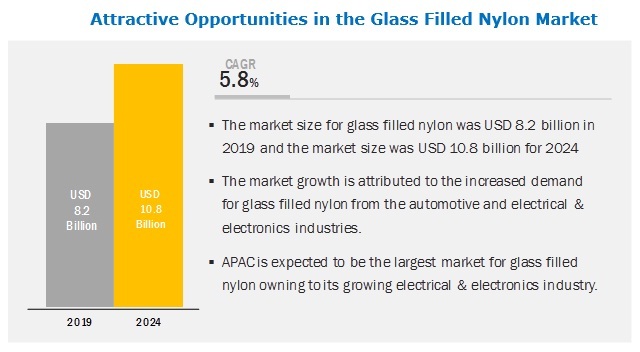 [121 Pages Report] The glass filled nylon market is projected to grow from USD 8.2 billion in 2019 to USD 10.8 billion by 2024, at a CAGR of 5.8% between 2019 and 2024. The market is growing due to the high demand from the automotive, industrial, and electrical & electronics industries. Automotive is expected to the largest end-use industry of glass filled nylon between 2019 and 2024. Automotive is the largest end-use industry of glass filled nylon. Glass filled nylon is an ideal solution for vehicle weight reduction. It is fast replacing metal parts in the automotive industry due to the ease of mass production as well as ease in molding it. Polyamides are also cheaper in unit cost in comparison to metals, which make them an economic alternative. Glass filled nylon is used in applications such as automotive engine covers, parts inside the engine compartment, and under the bonnet of cars. Polyamide 6 is expected to be the largest type of glass filled nylon in the next five years. Polyamide 6 is the most widely used glass filled nylon due to its easy availability and low price. It also offers superior properties such as good tensile strength, high mechanical strength, and chemical resistance. These properties make polyamide 6 based glass filled nylon widely used in the automotive and electrical & electronics industries. The injection molding segment is projected to register a higher CAGR during the forecast period. The injection molding segment accounted for a major share of the global glass filled nylon market and is projected to register a higher CAGR during the forecast period. The ease of manufacturing glass filled nylon through the injection molding process is expected to drive the market. The 30% glass filled nylon market is projected to register the highest CAGR during the forecast period. The optimum mix of properties of both polyamide resin and glass fiber, makes 30% glass filled nylon suitable for use in the automotive industry. It also provides high strength and rigidity. Several global glass filled nylon manufactures such as EMCO Industrial Plastics, Inc and Nylatech provide high grade 30% glass filled nylon. APAC is expected to lead the glass filled nylon market during the forecast period. APAC is a key glass filled nylon market due to the booming electrical & electronics and industrial sectors. China is one of the key consumers of glass filled nylon in APAC. The country has become the single-largest consumer of glass filled nylon in the electrical & electronics industry and is expected to strengthen its market position. The glass filled nylon market comprises major manufacturers such as BASF SE (Germany), Asahi Kasei Corporation (Japan), Lanxess (Germany), DowDuPont Inc (US), Royal DSM N.V. (Netherlands), Ensinger GmbH (Germany), Arkema (France), SABIC (Saudi Arabia), Evonik (Germany), and Ascend Performance Materials (US). In September 2017, BASF SE signed an agreement related to the sale of Solvay’s integrated polyamide business. In September 2018, Asahi Kasei Corporation acquired Sage Automotive Interiors Inc. and consolidated its glass filled nylon business. In October 2018, Lanxess launched a new polyamide to enhance its new product development capabilities and cater to the increasing demand for glass filled nylon. What are the major end-use industries of glass filled nylon? Which industry is the major consumer of glass filled nylon? Which region is the largest and fastest-growing market for glass filled nylon? What are the major types of glass filled nylon? 12.11.3 Emco Industrial Plastics, Inc. The study involved four major activities in estimating the current market size for glass filled nylon. Exhaustive secondary research was done to collect information on the market, peer market, and parent market. The next step was to validate these findings, assumptions, and sizing with industry experts across the value chain through primary research. Both top-down and bottom-up approaches were employed to estimate the complete market size. After that, market breakdown and data triangulation procedures were used to estimate the market size of segments and subsegments. In the secondary research process, various secondary sources such as Hoovers, Bloomberg BusinessWeek, and Dun & Bradstreet were referred, to identify and collect information for this study. These secondary sources included annual reports, press releases & investor presentations of companies; white papers; certified publications; articles by recognized authors; gold standard & silver standard websites; regulatory bodies; trade directories; and databases. The glass filled nylon market comprises several stakeholders such as raw material suppliers, processors, end-product manufacturers, and regulatory organizations in the supply chain. The demand side of this market is characterized by the development of the various industries such as industrial, electrical & electronics, and automotive. Advancements in technology and diverse applications characterize the supply side. Various primary sources from both the supply and demand sides of the market were interviewed to obtain qualitative and quantitative information. After arriving at the overall market size using the estimation process explained above, the market was split into several segments and subsegments.The data triangulation and market breakdown procedures were employed, wherever applicable, to complete the overall market engineering process and arrive at the exact statistics of each market segment and subsegment. 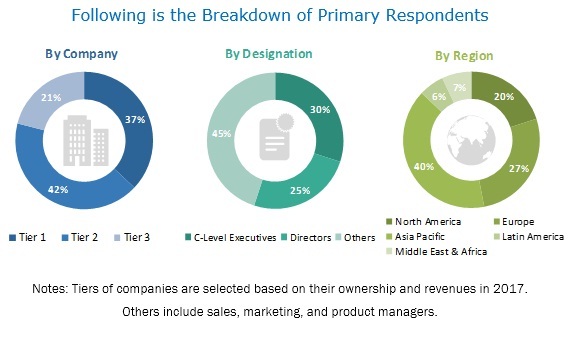 The data was triangulated by studying various factors and trends from both demand and supply sides in the automotive, industrial, electrical & electronics, and other industries. BASF SE (Germany), Asahi Kasei Corporation (Japan), Lanxess (Germany), DowDuPont Inc. (US), Royal DSM N.V. (Netherlands), Ensinger GmbH (Germany), Arkema (France), SABIC (Saudi Arabia), Evonik Industries (US), and Ascend Performance Materials (US). This research report categorizes the glass filled nylon market based on type, glass filling, manufacturing process, end-use industry, and region.